How to describe this ridiculous market? 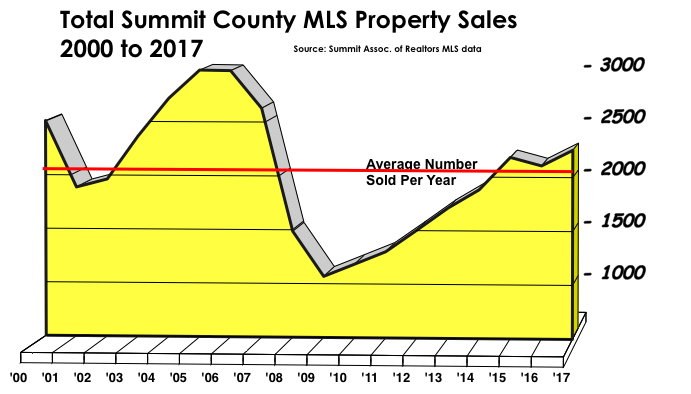 On the first day of 2018, there were a total of 510 properties of any type for sale in Summit County. 182 of these were land, 304 were residences. 88 residences were priced under $700,000 and nothing priced less than $225,000 was for sale at all. There was a six month supply of residences priced over $1 million and 3.5 weeks’ supply under $700,000. Residences priced over $1 million took an average 148 days to sell. Those on the market averaged 234 days since listed. Residences priced under $1 million took 44 days to sell and those on the market had been offered for 120 days. Clearly the market had slowed by the end of the year. So the market has been over-supplied with expensive homes and severely under supplied with lower priced ones. This lack of inventory in the most sought-after segment of the market is largely responsible for the third flat year of sales in 2017. A total of 2250 properties sold in 2017, 6.8% more than the year before and only 3 percent higher than in 2015. There has been a net gain of less than 2 percent over the past three years in the total number of properties sold. 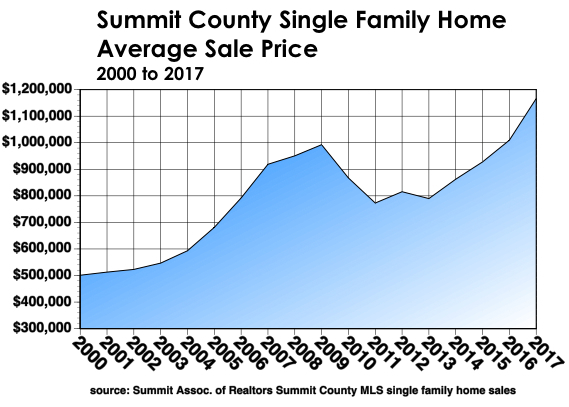 The average sale price jumped by 15 percent, however, to $650,500 – a new record by far for Summit County. The median price was $505,000, a substantial disconnect from the average and atypical for our market where median and average prices are usually very close. Clearly all prices increased, but the high-end dragged the whole market skyward. The $million plus market now accounts for 14.5 percent of residential sales, up from about ten percent last year. As construction costs continue to increase, and because nearly all new construction is in high-end single family homes, the average price for a single family home is now well over $1.1 million. 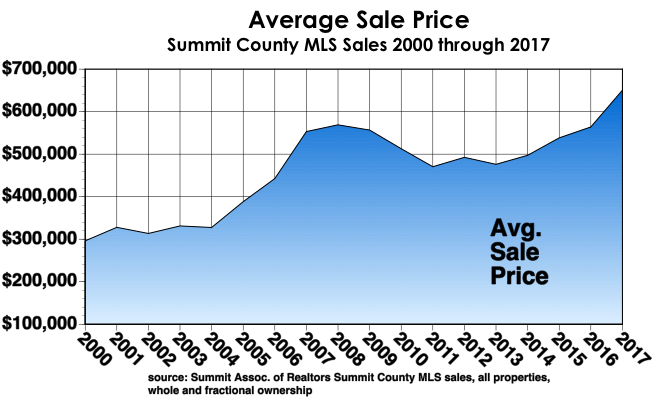 While prices have recovered and surpassed the previous historic high in 2009, sales volume has not recovered from the Depression of 2010. It’s running about 33 percent below the all-time high of about 3000 properties sold in both 2005 and 2006. The number of listings in July, when the inventory peaks every year, has declined for the past five years. The all-time high for listed properties was about 3000 in July of 2010. In 2017 it was 904. At this rate, there will be fewer than 800 properties of all types for sale next July. And chances are good that a third of those listed will still be land. Despite the lack of existing residences for sale, land has not kept pace with the total market. In fact the average price for 182 sales of vacant land fell to $327,300 in 2017, a decline of 4.5 percent. 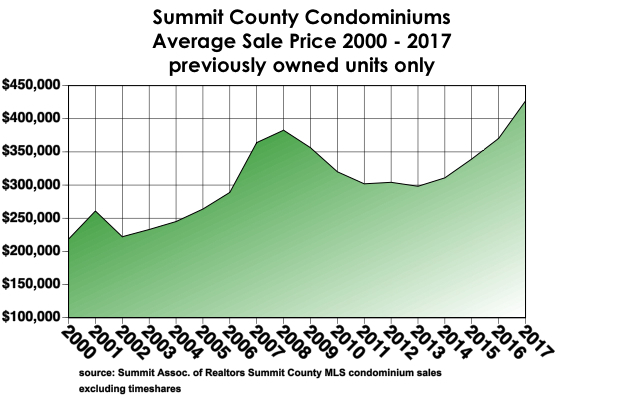 This is partly because all the easy to build on lots in Summit County are gone. It is also because the homes built on these $300,000 plus lots will need to be worth about four times the lot price, or $1.3 million, when completed and there are many existing homes to choose from in this price range. And million+ range represents only 14 percent of the whole market. 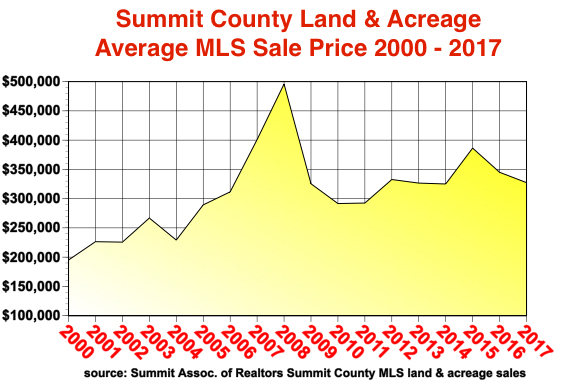 So about a year’s supply of land remains on the market year after year. Market conditions like this have never before existed in the 32 years I’ve been in business. Anyone thinking of selling a residence should grab the prices this market will bring while they can. Everything changes with time and usually before you think it will. And then it’s usually too late.